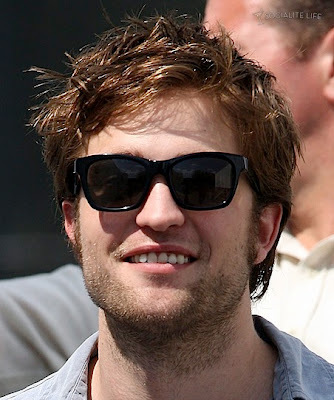 Even though I'm on a Peter high, I still need my Rob fix! 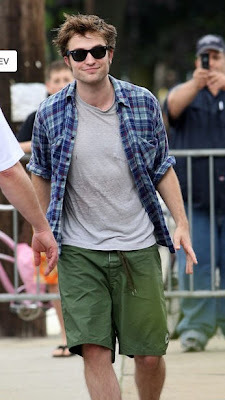 More pics from Just Jared posted from the set of Remember Me this afternoon. I hope you enjoyed the updates but here's the whole story....or the best I can remember it. I arrived at 12 pm and found primo parking and my place in line. I was about 15th (before the friends started to arrive). 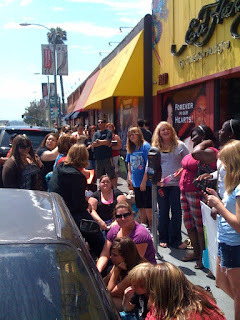 The girls in front of me also attended the Rob Hollywood blvd walk of shame. 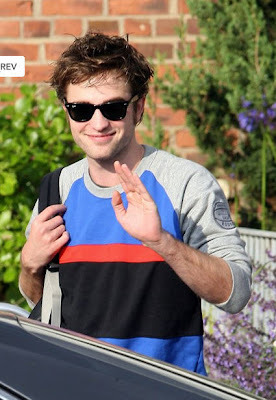 At 4 Peter arrives then 10 mins later he pops out and greets the fans who were waiting for him. The line wrapped around around the block, the residents and Ed Hardy probably weren't too happy with us but we were good kids, I swear!! Once Peter went back inside they sent in 6 at a time. The employees takes your picture with Peter, he signs on of his head shot and he was also streamlining on his sight. So I took a few pics of Peter with random fan (my TS sisters were further back). More Peter.....HOTNESS!! Now when were in line his people said Peter was providing headshots for everyone. He might not sign additional items and pictures were iffy. As you can see Peter said screw that let's have fun. So it was my turn, I was telling someone how I use to try to dress like Jennie Garth but sorry....it just didnt work for many, MANY reason. They said you HAVE TO TELL PETER THAT. So I'm telling him at 13 I tried to have the Jennie Garth look but it didn't work and my mom and I got tons of fights because the red lip stick was not working. He laughed and said that's cool. Me & Peter.....Peter & I.....Jennie, you're one LUCKY GIRL!! Now remember I posted about the Peter fan Felicia....well when she heard he was only signing his head shots, she was a little dissappointed but was still happy to meet him. 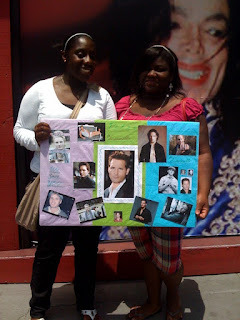 Well Peter saw the sign she made and signed almost every picture she put up. When she came out she was trembling. Felicia was on cloud 9. One of my favorite moments of the day was when I heard Felicia tell her one of the other fans not to say Taylor's name, it makes her blush and giddy. So through out the day I would say Taylor Lautner and she'd throw me a look. LOL basically we all had fun in line today. A special thanks to Affliction Clothing store and Ed Hardy (who had to deal with us outside their doors). my make up. Yes I'm that vain! Do I really need to say anything here? 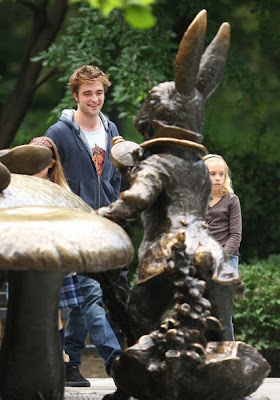 I mean A) its Rob! 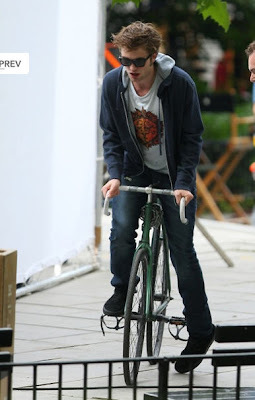 B)he's on a bike! LOL Enjoy! Was it just me but when I heard about the Twilight Tour I dreamt Kellan and I would work out together....well that dream is officially dead! Sadly, Kellan had to drop of the Twilight Cruise due to a scheduling conflict. From Alaska Cruise: We were just notified that due to a film commitment Kellan Lutz will not be able to sail on our Alaska Twilight Cruise in 2010. 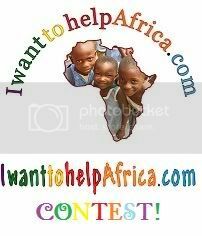 We will try to have him on our 2011 cruise. We have replaced Kellan with Alex Meraz who plays Paul in "New Moon". Even though the actors have signed contracts to go on the cruise… they have the right to cancel due to a work commitment. We are currently working on signing two other actors so that we will have 4 on the cruise. Thank you for your understanding and we are looking forward to a truly wondrous time in Alaska next summer. Wait....instead Alex will be there.....hmmmm....Yeah, I can handle that! Off to go buy a ticket! So Ashley Green and Alex Meraz will be attending the Twilight Cruise. 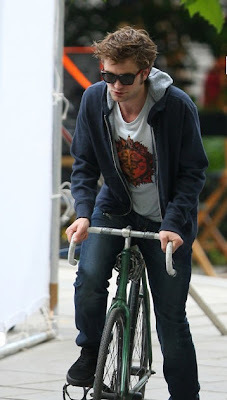 Lion & Lamb has posted more pictures from the Remember Me set yesterday. 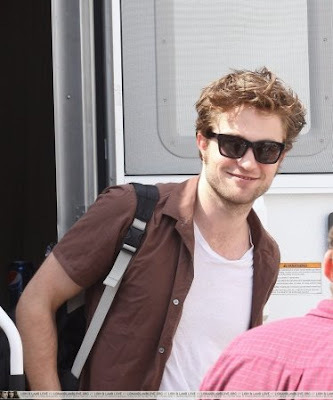 I think Rob looks adorable with his back pack and brown shirt. 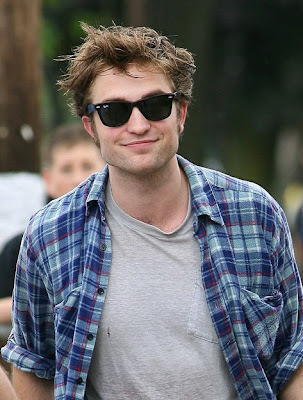 I love his smile! It cheers me up all the time! Okay these pics are from Friday but WHO CARES! He looks so adorable I couldn't resist and if Wearingwords has already posted....well you don't mind, right? 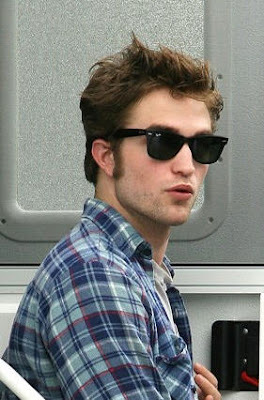 It's ROB-FREAKIN'-PATTINSON!!! Why does he look so ADORABLE? 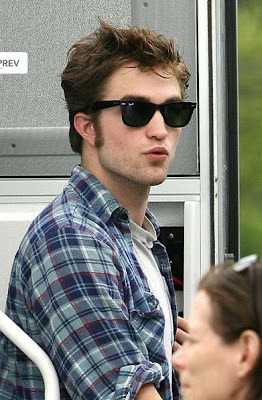 Seriously Rob, Dunkin Donuts Coffee?! That crap tastes like feet....poor Baby! Don't worry I'm flying out there with a Starbuck Sugar Free Vanilla Latte!! ASAP! I love set updates! Can you tell? So The Gossip Center (previously known as The Gossip Girls) have posted new pictures of Rob and Emilie arriving set today. Some spectators are saying he's in a better mood (damn that man and his smile!! ).